It's being advertised as a "Rolls Royce" custom wagon, but a closer look reveals this interesting custom creation is little more than a 1971 Ford Custom Ranch Wagon wearing the disguise of an English luxury car. Currently listed for sale on Hemmings, where we came across this unique wagon, the seller claims it was 1 of 8 built using authentic RR sheet metal, emblems, and wheels. We have no idea what happened to the other 7, and we've certainly never seen another one. Underneath the surprisingly well executed modified body this wagon is just a dressed up Ford, complete with a fresh 400 V8 underneath the hood (don't let the RR emblems on the valve covers fool you). 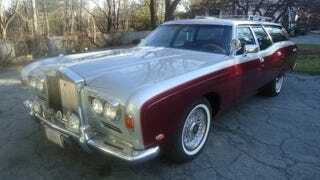 Looks like a Rolls, drives like a vintage Ford wagon. Call us simpletons, but the opposite of this equation actually sounds a little more appealing. If possessing "All the pleasures of living the Rolls-Royce life with no service issues" is an appealing proposition it will cost you the pleasure of having $32,900.